Look What Was On My Door! This was hanging on my door. It’s called a “door hanger” by the boys on Madison Avenue. In this case, this door hanger advertises a cary out special. Boy, she’s really enjoying that pizza, huh? Now, here’s the thing. This isn’t the first time they’ve advertised a cary out special on a door hanger. They did the same thing a few months ago. They spelled “Hawaiian” correctly that time, too! Am I going to get sued for putting this thing here? Can someone check on this for me? I don’t need any more problems. Okay, let’s look at the bottom half of their door hanger. 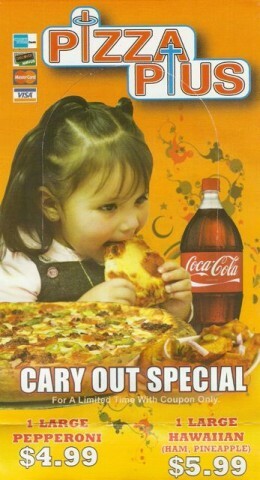 You know, the one advertising their cary out special. Gee, that lasagna looks good, huh? And the calzone looks like something that was crawling on my geranium one rainy morning after I poked it with a twig and it retracted its eyestalks. And by that I mean it also looks delicious, of course. 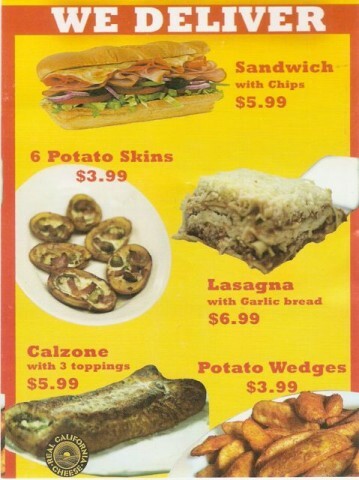 I like how each illustrated menu item is in a completely different degree of focus than the next. You can see this much better on the actual cary out special door hanger, but since it’s here and you’re there, and I do not want company today, you’re just going to have to take my word for it. But seriously…? I’ve bought food here and it’s awesome! I’ve had delivery from here and also ordered cary out. It’s the best food in whatever area it is that this place is located! I highly recommend them! And they get high marks on both Yelp and some other local restaurant review website. Look, I just got a kick out of their cary out special door hanger is all. Posted by Ted on April 14, 2011, 1:04 AM.